Receive more great content, special offers, and the latest news. All stoke, no spam! What is the Difference Between Team Bonding and Team Building? Customers often ask us, “what is the difference between team bonding and team building?” While the two things may sound the same, they are actually quite different, and it is important to know exactly what you’re looking to gain from these exercises before signing your team up for one of these events. Our Team Bonding experiences are held here at High Gravity Adventures and are generally more loosely structured events focusing on fun and fellowship. 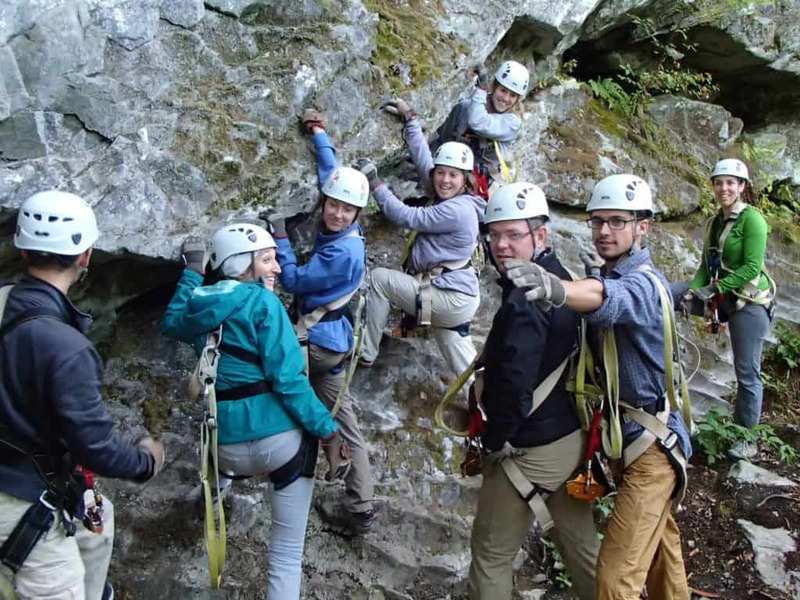 The purpose of our Team Bonding events is to give your team an adventurous experience that allows you to organically bond as a group and have fun together. This includes an afternoon of fun on our 75+ Aerial Challenges, a Zip Line Tour, a ride on our Giant Swing, and more. Team Building is a much more structured activity, Group Workshops with Low Ropes (ground-based) or High Ropes (aerial) programming, facilitated by a team of experienced educators who will devise a curriculum to meet your need. Together you will establish and work towards customized goals to build connections through shared experiences, overcoming obstacles and solving problems as a team. These workshops can be held at the Blue Ridge Learning Center, or our educators can come to you. Team Building and Team Bonding experiences can each have profound impacts on a work environment. Whether you’re looking for greater cooperation in the workplace, or a family looking to forge deeper bonds, our team workshops will create memories and give you skills that will last a lifetime. Choose the path that’s right for you, and your team can share an experience that will make them stronger and more efficient than ever. Matthew Lucas is the Social Media and Communications Coordinator for High Gravity Adventures, Challenge Towers, Aerial Adventure Tech, and Blue Ridge Learning Centers.